CHICAGO (FinalCall.com) - All across the world family, friends and well-wishers of the Honorable Minister Louis Farrakhan, continued their prayers for his health and recovery after his January 5th surgery. “The doctors were pleased with the outcome of the operation,” reported Minister Ishmael Muhammad, National Assistant Minister to the Honorable Minister Farrakhan. Minister Farrakhan underwent a major and serious 12-hour abdominal operation, to help correct the severe damage caused by the radiated seed implantation procedure he received to treat his prostate cancer. “The doctors are guardedly optimistic about a full recovery that would significantly reduce or completely remove the constant pain that the Minister has experienced over the past several months and literally years,” Min. Ishmael went on to say. Considering what the Minister just went through, he looks very, very well. The recovery for Minister Farrakhan will take several weeks, but he is expected to be in Detroit for the Nation of Islam’s 2007 Saviours’ Day convention, February 25th, God willing, where he will deliver the keynote address entitled, “One Nation Under God” at the Ford Field Stadium. “Before he went into surgery, the Minister said he set his face resolutely on Detroit,” explained Min. Ishmael. All of this was good news to the countless numbers of people from coast to coast and around the world, who expressed prayers and well- wishes for the Minister’s speedy recovery. Prior to the Minister’s surgery, the believing community of the Nation of Islam went on a nationwide fast and prayer vigil asking Allah to bless the Minister for a complete recovery. During the webcast, Minister Ishmael spoke on the great sacrifice of Fatima Muhammad, the Minister’s daughter who continues to be his nurse 24/7. On behalf of the Nation of Islam, he also thanked Minister Farrakhan’s wife, Mother Khadijah Farrakhan, for her sacrifice. Minister Ishmael said that the Nation was blessed to have her abundance of strength that allows her to stick with the Minister every step of the way. The many thanks included his children that have dropped everything in their lives to be with their father. The Nation is also thankful to the Minister’s security team, as well as the cooks who have worked tirelessly at their jobs. The following are excerpts from the warm regards received by the International Representative of the Nation of Islam, Minister Akbar Muhammad, on behalf of the Honorable Minister Louis Farrakhan. Col. Mu’ammar Gadhafi, leader of the Libyan Revolution and Commander of the World Islamic People’s Leadership, through the office of the Secretary-General, Dr. Mohammed Ahmed Sherif, sends well-wishes and prayers from the Libyan leader and his people for a speedy recovery to Minister Louis Farrakhan as the Deputy of the Worlds Islamic Peoples’ Leadership. Imam Warith Deen Mohammed called to say that he is praying for the Minister’s recovery and sends his love and special greetings to Sister Farrakhan and the family. Imam Siraj Wahaj of Masjid Al-Taqwa, called while Minister Farrakhan was in surgery to say that he’s offering his prayers and his community will be praying for the success of Minister Farrakhan’s operation. Dr. Abdul Alim Shabazz, distinguished professor of mathematics and Islamic scholar, offered special prayers for the full and speedy recovery of Minister Farrakhan. Sheikh Mohammed Salis Shaban, then conducted special prayers on Friday Jan. 5th for Min. Farrakhan’s successful surgery. They asked Allah to spare his life and strengthen his health so that he could continue to champion the cause of Muslims and Islam worldwide, and to bless him to bring about the unity of Muslims in cooperation with the human family so that we can live in peace. The Islamic Society of North America under the leadership of Dr. Ingrid Matteson, offered her special prayers for his quick recovery and sends good will through Dr. Sanusi Mohammed. Dr. Mohammed also added that the Muslim world today is very much in need of the voice and contribution of Minister Farrakhan. From Morrocco, special prayers were offered for Minister Farrakhan’s health by Dr. Sidi Ahmed Kostas, along with Dr. Ahmed Addadi of the Ministry of Religion and Endowment Affairs of Morrocco. Sheik Ahmed Ben-Omar Tijani offered prayers and called his many contacts in the Muslim world to inform them that Minister Farrakhan was about to have surgery and asked them to pray with him for a successful conclusion of this surgery. Sheik Tijani informed us that prayers were offered from Al-Aqsa Mosque in Jerusalem. Luqman Abdul-Haqq (Kenny Gamble) of Philadelphia said that he was praying for the Minister before he went into surgery and asking Allah to bless him with a successful and a speedy recovery. Bob Law and Viola Plummer (New York) offered their prayers for a speedy recovery of Minister Louis Farrakhan. James Mtume of New York called to say best wishes to his Brother and friend for a speedy recovery. The following are excerpts from the warm regards received by the Chief-of-Protocol, Sister Claudette Marie Muhammad, on behalf of the Honorable Minister Louis Farrakhan. 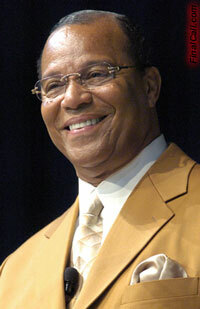 “Love and greetings go to the Honorable Minister Louis Farrakhan and to his family. The priesthood of this community will be offering special prayers for the success of the surgery. His family and all the saints worldwide will be offering prayers,” said the Honorable Ben Ammi Ben Israel through his representative Prince Asiel Ben Israel of the Hebrew Israelite community. Tavis Smiley, commentator, activist and author, told Claudette Muhammad that he had spoken to the Minister before his surgery and extended his love and greetings. He said that he would keep the Minister lifted in prayers. Actor and activist Harry Belafonte, also spoke to the Minister before his surgery and sent his love and hope for a successful recovery. People from all walks of life and from different faiths, to those families whose lives have been touched and changed by the decades of work of Minister Farrakhan, have been offering prayers at all times of the day, in many languages, and by the young and old. We continue to pray for his speedy recovery.